SSN looks to extend the smart grid to streetlights, parking meters and other battery-powered endpoints. Silver Spring Networks wants to push wireless connectivity beyond smart meters and grid sensors out to all kinds of remote devices -- including those that aren’t plugged into the power grid. That’s the purpose of the Milli 5, the new, super-small wireless node unveiled Wednesday by the Redwood City, Calif.-based smart metering giant. It’s a little bigger than a quarter, and is meant to keep all sorts of battery-powered devices connected to the network for up to twenty years, using the same IPv6 addressing that connects Silver Spring’s grid-powered devices. Silver Spring announced the Milli 5 as part of a broader launch of its new Gen5 technology platform, which features some big claims of enhanced performance. These include speeds of up to 1.2 megabits per second, up from 300 kilobits per second as of 2012, as well as 10-millisecond latency, 5x extended range, and more processing power and memory for its SilverLink Sensor Network-enabled devices. All of these networking advances are built on Silver Spring’s use of the IEEE 802.15.4g specification, which is the emerging standard for the wireless mesh smart-meter networks being deployed across the world. Silver Spring isn’t the only smart meter networking vendor tapping the enhanced capabilities of this technology. Cisco and Itron are using 802.15.4g wireless for their smart grid and smart city efforts, and Toshiba’s Landis+Gyr is using it for its 27-million smart meter deployment in Tokyo, to name two prominent examples. But battery-powered wireless devices are a trickier matter, requiring careful management of just how much electricity is being used to receive and respond to the constant signals being passed back and forth amongst meshed devices. 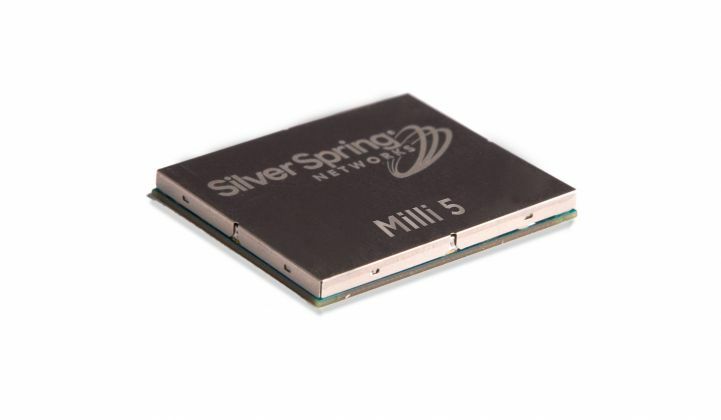 Silver Spring’s Milli 5 is one-seventh as big as the company's previous networking node, with a fivefold reduction in power consumption -- all while increasing range and operational life. “With Milli, we’re able to go in and aim at some of those lower-end devices,” he said. Some of these devices are far from cost-effective sources of power, such as water and gas meters. Others, like pole-top transformers, may be right next to power lines, but can’t effectively use that electricity to run digital devices, at least not without expensive alterations. Adding low-power sensors to the mesh also allows Silver Spring to potentially get its network into areas that point-to-point wireless systems might have a hard time reaching, he said. “The problem with those systems is they can’t see around corners -- but we can mesh around corners. 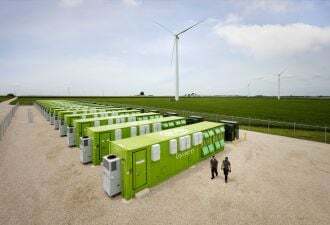 That gives us a head start in areas where you can’t have a continuously powered network,” he said. “As you get into smart cities and internet of things, there are a plethora of devices we can go into,” Reeves noted. These could include parking meters and monitors, trash bins and traffic detectors, or air or water pollution sensors, to name a few of the systems most often talked about in the context of networking municipal assets and services. Silver Spring is just one of the many smart meter players targeting this nascent field, of course. Competitors like Itron, Sensus and Landis+Gyr are also working on smaller devices, ubiquitous network coverage, distributed intelligence and the like, in hopes of expanding their market beyond the smart meter network. So far, networked streetlights have been the primary line of smart-city business for these vendors. Silver Spring has smart streetlight projects in Paris, Copenhagen, Miami and Chicago, and while these streetlight communications modules don’t need batteries to run, they may want to talk to traffic lights and cameras, parking sensors and other devices that do need them, Reeves said. Silver Spring says its Milli 5 platform can achieve decades of operation in the field without sacrificing network security and quality of service. “You’ve got to make sure you’re doing it all securely; you’ve got to make sure there’s an audit trail out there, that the operator knows what’s going on,” he said. Reeves said the device is “aligned with developing standards” for IPv6-compliant low-power mesh networking, though the company hasn’t yet released any technical data on just how it’s achieving that aim. That's going to be an important part of discussions with would-be Milli 5 partners, since the world of internet-of-things connectivity should really be built on common standards. It's technically possible to extend an 802.15.4g network to in-home devices now served by bridges to ZigBee, Z-Wave and other low-power wireless protocols, for example -- but only if everyone's low-power IPv6 mesh technologies can get along. That’s an emerging area, with all the aforementioned contenders working on their own solutions, that's sure to be getting a lot of attention in 2015.